There's nothing that reminds me of my childhood summers more than the taste of warm raspberries off the vine. I would pick endless cups filled to the brim with them at my grandfather's house. 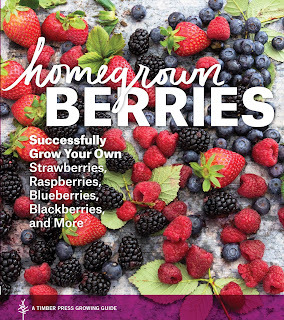 But trying to grow my own isn't as simple as it sounds, which is why I've found "Homegrown Berries" to be indispensable reading during this year's growing season. Some of the advice offered is practical, such as matching the site location to the berry as opposed to trying to grow a plant in an unsuitable location. (For example, putting blueberries in damp ground - which they like - as opposed to very dry.) More specific details - for example, how to trellis raspberries and black raspberries or tips for renovating June-bearing strawberries - can be found in the book as well. I like how the sides of the book are color-coded so you can flip through and easily find a particular berry section. (Red for strawberries, blue for blueberries, purple for raspberries and blackberries and green for specialty berries.) Each section goes into detail how to grow each specific berry, even recommending several varieties. I especially enjoyed the specialty berry section, a content area I feel is often overlooked. (I discovered helpful tips when looking up elderberries, a berry that's new to my garden, after learning about the ideal planting site for the bush.) Gooseberries, currants and elderberries are mainly discussed in this section, but there is some space dedicated to cranberries and jostaberries, for example, as well. "Homegrown Berries" gives the gardener confidence to establish their own berry patch, which will not only provide delicious temptations in the future, but will save money as well. "Homegrown Berries" retails for $19.95 and is published by Timber Press. The publisher supplied me with a courtesy copy of the book.